You can purchase the Yerka Art in different ways, depending on your needs and how much you intend to spend. – the most valuable and decorative kind of art, painted on canvas with acrylic paints. They are also most expensive, that is not surprising when you know how much time the Artist has to spend to create it. Usually a new acrylic work is a great event. Works made on this medium have outstanding brightness, most vivid colours resulting in three-dimensional effects. Using acryl, it enables the Artist to show all details of his complex works. – made on soft paper with special pastel crayons, also require lots of time of work, however they may not be able to render so much details and express less three-dimensional effect than acrylics. Instead of this, they give smoothness and softness of forms and provide full colour of clear pigments. Pastel works are often used by Yerka as preliminary projects of future acrylic paintings. – it is a new born technique of reproduction of a work based on the original item – a limited edition high quality signed prints. They are made in issues of 19 or 50 pieces, each is signed by the Artist and numbered (for ex. 3/19 means third of 19 issued). Giclee is a follower of lithograph or serigraph. 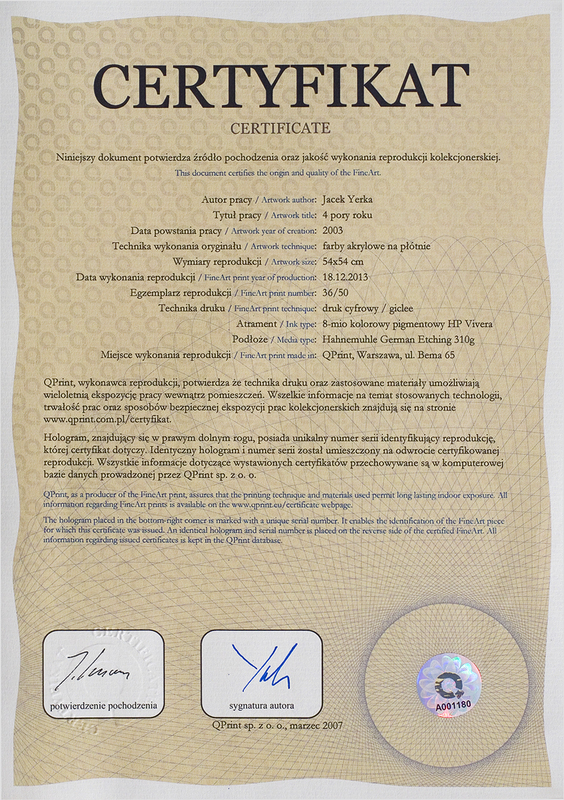 Each giclee is accompagnied by a certificate signed by the Artist and the Print House. Giclees are sold unframed or framed in wooden frame with passepartout behind glass. – made with pencil (or crayons) on paper, they are mostly projects or sketches of larger compositions. Despite its sketchy style , they are highly finished and charming, often desired by collectors. The information about framing is available at the work description. Giclees are mostly sold without frame, while pastels and acrylics do have frames. You must be aware, that a project reflects just a rough idea of the final work, that will be filled with many more details, structures and enriched in colours. Some small suggestions to the work are acceptable but in general it is much better to avoid any influence to Artist’s vision as he gets best results when his spirit is not bound by anything. More, the projects by themselves – which are usually small size drawings made with pencil or crayon are also available for collectors through auctions on Agra-Art site or in our shop section. Pastel works are more like projects to acrylic paintings, they are rarely made for a special demand. They help Yerka to develop more consistent idea of future final work, but due to the technique they cannot render all beauty and colourfulness of acrylic painting. Some acrylic paintings and pastels can be found in our Art Shop area or on Agra-Art auctions. Sometimes the old works come back to us and are put on sale as well. You can order a giclee based of a chosen painting. Not all paintings are suitable for making giclees – as some of them have such richess of colours that giclee technique is not able to render it properly. Some of giclees are available at once – as we may have it in stock. You can check it in our Art shop. If the one you look for is not available we can make it upon your order. First send us number, title or picture of the painting upon which you would like the giclee to be made. We check if the work is suitable for it (if there is not a risk of strong color distortion). The prices for pastels and acrylics are given as a range – usually such important works are put on auctions, and are seldom given for gallery sale. However we put for sale Yerka’s works from the other collectors, on the consignment basis, so the price may vary. Since Jacek Yerka is really very creative individual, we are open for all kind of cooperation – as custom orders for paintings, drawings, design work or animation. If you see any opportunity for some joint projects please let us know. Depending on his time schedule, the Artist accept also orders for new paintings or, unlikely, new versions of already made paintings (only some of them qualify). The approximate time of work on a new painting is up to two months since all terms agreed. For pastels or paintings made upon projects, the 30% advance of agreed price is required. The time of completion certainly depend on various factors – usually it takes from 2 weeks up to 2 months. All graphic files, reproductions, titles are copyright protected. All usage of the material found on this website is subject to the written consent of the Artist or the Agent . All usage of other material, being intellectual property of the Artist also requires his written consent and agreement. All payments are to be made through Artist’s Agent – Agra-Art SA. All prices are based on Polish currency and quoted in Euro. We also do PayPal. You can claim a mailed Paypal invoice or use Buy-it-now buttons. Alternatively you can also use credit card through Paypal. We ship unframed giclees in a carton tube by registered post package. For framed works we ensure proper and safe packing in carton boxes with bubble wrap and foam fillings and use Pocztex (Polish mail express trackable) courrier service by default. If you wish we can also use Fedex. Go to our packing & shipping section to see examples of rates.